Cover. Avalanche is a post-bound book, with a matchbook-style (i.e., the back cover extends far enough to wrap around the foredge and tuck into the flap on the front cover) letterpress printed cover featuring a foredge die-cut to reveal the edges of all the pages. This book uses the physical route of the Georgian Military Highway as a narrative device to link five short prose pieces of the fall of communism. Pages 20-21. 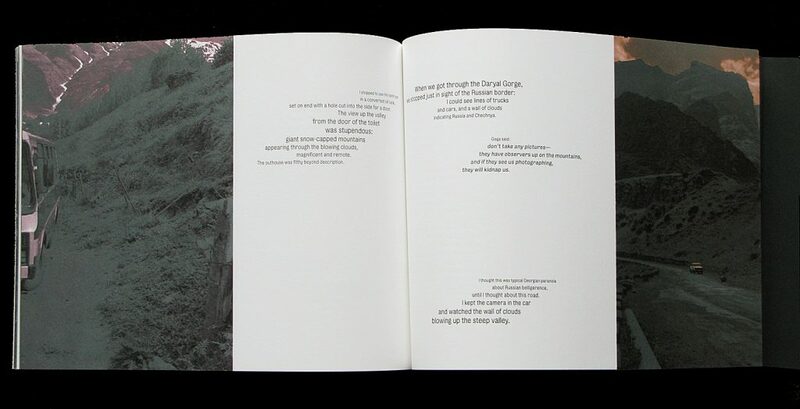 Avalanche is printed on only one side of the paper, with the fold positioned at the foredge, so the images, which are scaled to be 1/9 longer than the page, slowly “crawl” across the page, up over the foredge fold, and onto the next spread every nine openings of the book, thus echoing the Georgian Military Highway, which crawls up over the high Caucasus Mountains. 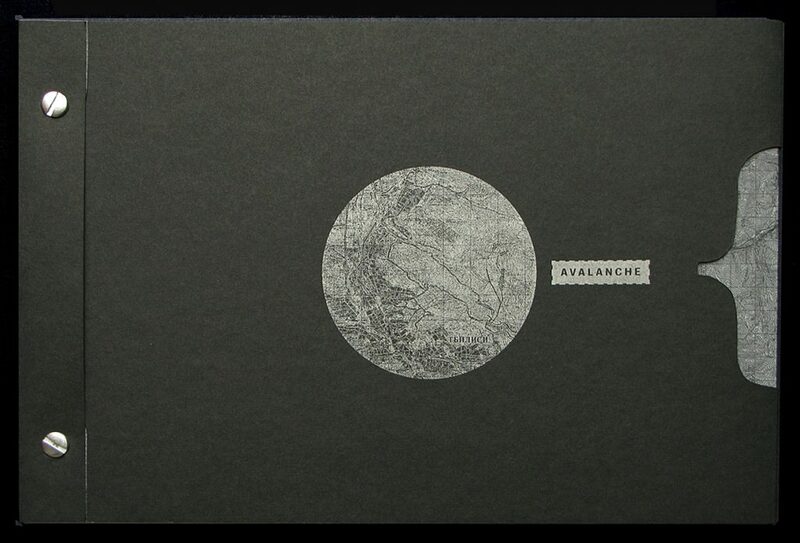 The first half of the book is printed in a very extreme two-color duotone, a murky, post-soviet gray-green. Pages 30-31 At this point in the book the narrative is very high up in the Caucasus Mountains, the color softens, and warms up the images. From this spread onward the images are printed in a variety of three and four color monochromatic treatments. The tunnel mouth in the picture is one of the Soviet-period avalanche shelters. I have come to believe that one of the greatest strengths of artists’ books as a form is their ability to deliver complex, nuanced artistic presentations. Books develop over time, and given sufficient time in the space of a book, the narrative that inevitably arises makes books engaging, transformative, and memorable. Each image, each turn of the page, each bit of text, each juxtaposition, the haptic experience of the object itself, adds to the total, and, with each addition, the reading shifts and changes. The reader can be led through a potentially transmogrifying experience, transforming perception. The complexities possible using even the simplest book structures seem inexhaustible. Sequence, text, color, placement, pacing, typography, and the other characteristics of the book are enough variables to produce an infinite series of engaging experiences. 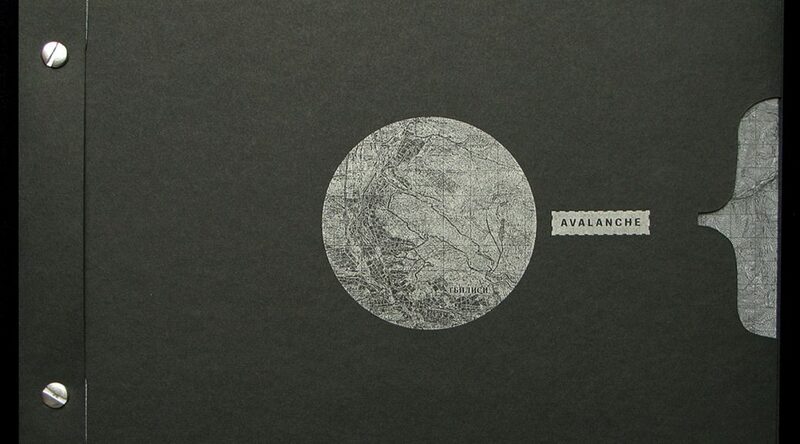 Avalanche uses the physical route of the Georgian Military Highway, a road built to ­support the Russian annexation of Georgia in the early nineteenth century, as a narrative device to link stories of the consequences of the fall of Communism and the breakup of the Soviet Union. The form of the book, a post-bound book composed of sheets that are folded and printed on one side, presents a fold at the foredge, a literal mountain that the images slide up and over in the course of the narrative. 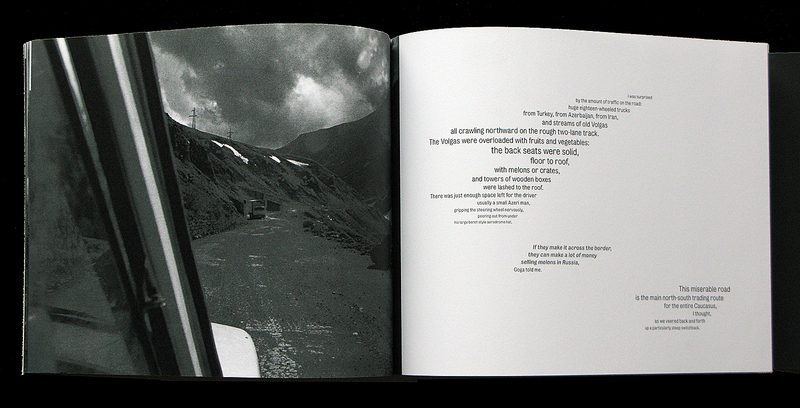 The prose pieces are linked by a typographically expressive narrative of a trip up the Georgian Military Highway to the Russian border.